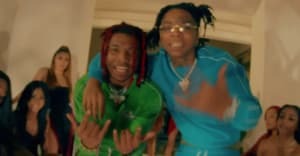 Lil Gotit continues to pour out music; on Friday, the up-and-coming Atlanta rapper shared a new song and video titled "Never Met." Watch the clip up above. The track comes fast on the heels of Gotit's sprawling 18-track Crazy But It's True project, which was released in March. Over the month, Gotit has released visuals for "Drop The Top" featuring his brother Lil Keed, and "Superstar" — a cut off of Hood Baby featuring Gunna.